Batter up! Please discuss pilot baseball here! Talk about perseverance, this thread was started 9 years ago and was not used until today, and also today a Pilot who was drafted 11 years ago finally made it to the major leagues for the first time ever. I believe Austin Bibens-Dirkx played only one year at UP after transferring from Chemeketa CC for the 2006 season and before being drafted in the 16th round by the Mariners. 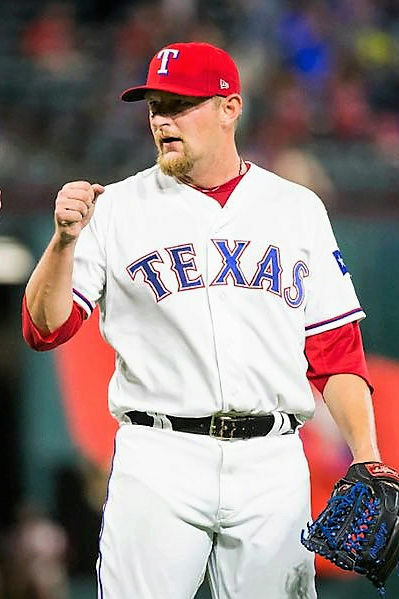 But yesterday the Texas Rangers purchased the contract of the 32 year-old career minor league pitcher from AAA Round Rock, and this morning he was added to the Rangers' roster and joined the team in Seattle. He received the phone call Saturday morning and hopped on a flight to Seattle. He didn’t learn until Sunday morning that he would be added to the roster. The first thing he did Saturday was call his wife. Mike Heika - Sports Day wrote: The reality of Austin Bibens-Dirkx's situation hit home Tuesday. The 32-year-old right-handed pitcher was told he would make his first start in the Majors Wednesday against the Tampa Bay Rays, and reporters asked if family would be able to fly in. Bibens-Dirkx has followed the same work ethic as his family to get where he is. After 11-plus seasons in the minors, he was called up to do some bullpen work for the Rangers this season. It was a dream come true for the Oregon native and University of Portland product when he made his MLB debut in Seattle earlier this month. He has since added two long relief sessions, and that means he’s a perfect candidate to get the start for injured A.J. Griffin. That didn’t seem possible a month ago, but the rise of the veteran rookie isn’t as surprising when you study his experience. Bibens-Dirkx has thrown more than 1,000 innings in the minors and another 337 in foreign leagues. He has participated in the Venezuelan Winter League in 2013, 2015 and 2016, and faced some of the Major’s best hitters. 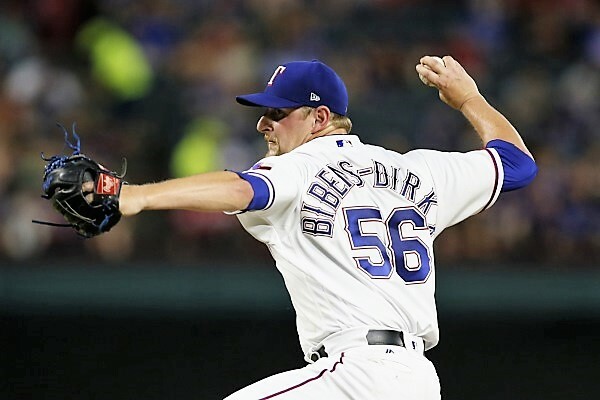 Bibens-Dirkx has a 3.97 ERA in four appearances and has earned the trust of his manager. Unfortunately, every time MLB or ESPN cut into the Rangers game early on it was to see another hit or run by Tampa Bay. But despite Austin's numbers, 4.2 IP, 5 H, 3 R, 3 ER, 3 BB, 2 K, it was still a decent outing for a guy who took 11 years to do it. The Rangers were trailing 3-2 when Austin left the game, but they eventually took the lead before losing in extra innings....so no decision for the veteran rookie. One has to hope Texas gives him another opportunity to start...but even sticking on the roster as a long reliever has to be a joy for him and heart warming for all who know his story. Austin Bibens-Dirkx let up 3 hits and 1 run in 7 innings against Washington yesterday, and Max Scherzer let up 3 hits and 3 runs in 7.1 innings, as the Rangers downed the Nationals, 5-1. Austin is now 3-0 after beating the Yankees last Saturday, 8-1, and starts tonight against the White Sox in Chicago. And a bit of an update on his time in the majors, including an understanding wife! 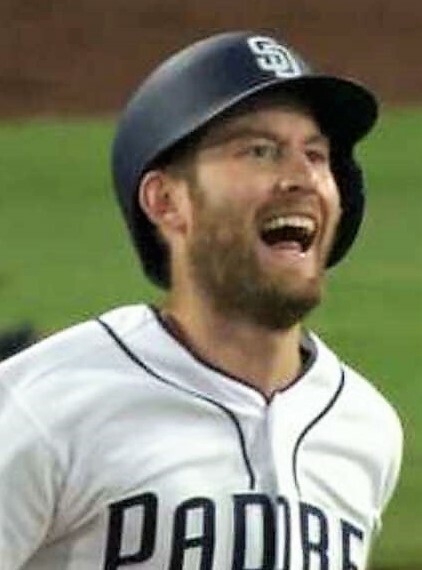 Rocky Gale was once again called up by the Padres and hits his first ever homerun! Have a day Mr. Gale! SouthCarolinaPilot wrote: Rocky Gale was once again called up by the Padres and hits his first ever homerun! Have a day Mr. Gale! Ten years ago, attracted by his name, my 10 year-old niece had a crush on UP freshman Rocky Gale that he rewarded with his autograph on her baseball glove. Yesterday, now about the same age he was then, she texted from college in New York, "did you see Rocky hit his first homer?!!!" I told her I did, but I didn't tell her it was only because I saw the video on PilotNation.